Heavy-duty electronically controlled turnstile can be equipped for automatic revenue collection systems. Uniquely upgradeable so that the turnstiles will remain for decades as revenue systems are changed. Wear and corrosion resistant. High security vault. Large captured ticket capacity. Extremely fast. Exceptionally low maintenance. Extremely long service life. Designed for the look of modern automatic fare collection systems. Three rotor sections provide a comfortable passage while still maintaining high security performance. 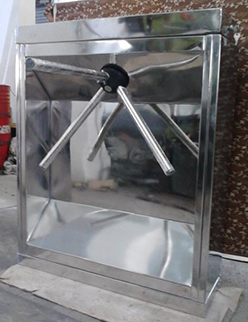 Units are available with mechanical or electrical operation, in either one or two way operation, with any combination of fail lock or fail secure.